When singer Colin Carter left the band he formed Flash in 1971 with former Yes guitarist Peter Banks. Flash was an English progressive rock group; bassist Ray Bennett and drummer Mike Hough completed the line-up. 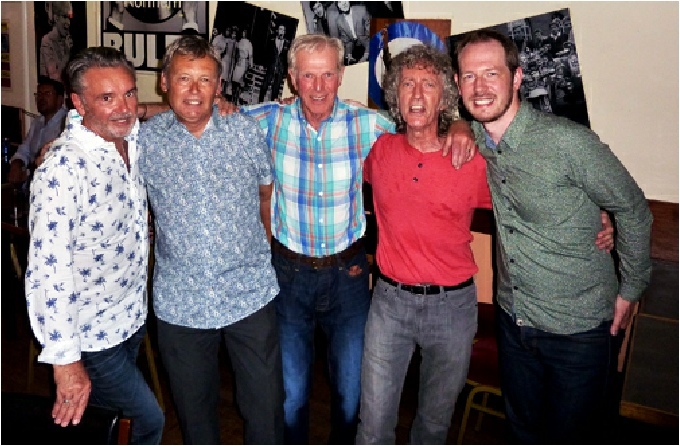 On Saturday 11th July, 2015 former members of Coconut Mushroom Colin Carter (vocals), Terry Threadingham (drums), Graham Barnes (bass) and John Clark (guitar) met for a one-off gig at Southsea’s Dock Club and after only a few minutes rehearsal took the stage - together again after 45 years. Luke Anthony (stage far right) sat in on guitar. The above video is of the band playing the Byrd’s Rock and Roll Star. The person crossing in front of the camera is Alan Williams (thanks Alan!) who was the drummer with the St. Louis Checks, another top 1960s Portsmouth band. 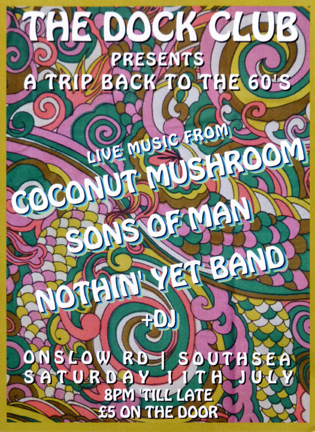 Sons of Man, another popular 1960s Portsmouth band still together also played songs from their back catalogue.